Laminate flooring is one of the fastest growing segments of the flooring industry. Laminate flooring technology has led to improvements in construction methods and styling have contributed greatly to the popularity of this resilient type of floor covering. Laminate flooring not only provides a long lasting floor type, but also a great and affordable alternative to 'real wood' floors. Laminate flooring is for those people who are looking for a 'cushioned' hard surface, and laminate is the only logical choice. Laminate floor choices are many, so are the different underlayment choices (which are discussed below) that not only provide moisture and sound deadening benefits, but also contribute greatly to a 'non-fatigue' walking experience. Back layer - Laminates back is reinforced with melamine for structural stability and moisture resistance. Fiberboard core - Laminate has an ultra dense core board that provides impact resistance and stability. It also features an edge sealing treatment that provides even further structural stability. Decorative layer - Laminate floors beauty, the decorative layer is actually a highly detailed photograph that gives the laminate the appearance of wood or tile. Wear layer - Laminate has a melamine wear layer is a tough, clear finish reinforced with aluminum oxide, one of the hardest mineral compounds known to man, to resist staining, fading, surface moisture, and wear. Aluminum oxide is also applied to the back layer to seal out moisture. Laminate flooring made today is truly a technological breakthrough. There's no staining, no fading, and no wear through. 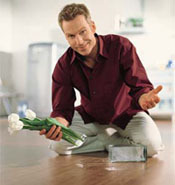 And it's glueless floating installation makes installing your new floor easier than you ever thought possible. After installing over 2000 SF of a product from Balta in my own home, I can assure you that there is not a finer locking mechanism on the market, nor is there a more durable wear surface available. The texture of our new floor has everyone who admires it thinking it is actual hardwood. All I have to do to maintain it is pass a vacuum over it periodically and occasionally damp mop it. Being a licensed flooring contractor for some 30 years, I can honestly say that I have never come across a better product that installs as easy as this did or that has performed as well. Designed to draw sound into the felt based pad and deaden it, not reflect it. Quietwalks filaments are randomly air laid creating a capillary affect to cushion the floor, absorb sound, and help laminate floors sound like real wood. Quietwalk can wick water and disperse it throughout the pad until it can evaporate or escape through the subfloor. It contains a built in vapor barrier to protect laminate from harmful moisture. Quietwalk can absorb over 5 times it's own weight in water without swelling or deterioration while the vapor barrier keeps water away from your floor. Quietwalk works great over both wood and concrete subfloors. This is a superior grade 100% Urethane Pad. It draws sound thereby helping the floor sound more like real hardwood. It has one of the highest impact insulation class ratings of 58-60 db. It is guaranteed to prevent damage caused by hydrostatic moisture rise. Water cannot go through this pad. No additional moisture barrier required over concrete or wood subfloors. Made from all new materials…….no recycled waste. Has a built in anti-microbal ultrafresh compound which helps prevents the growth of mold, mildew and fungus. It also greatly increases insulation over cold floors. Heavyweight Pads are 16 lbs per 100 sq ft. vs. 1 lb per 100 sq ft of the foam pads. For more information on this and other hardwood products... FloorBiz is your starting point to all the important floorcovering sites on the internet.